Former Auburn University men’s basketball coach Sonny Smith (center) spoke to the Auburn Rotary Club about his experiences as head coach from 1978 to 1989. During Smith’s 11-season tenure, Auburn made five straight NCAA national championship tournament appearances while coaching Auburn standouts Charles Barkley, Chuck Person and Chris Morris, among others. 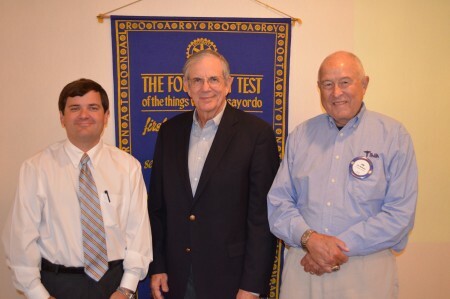 Pictured with Smith is club president David Reeves (left) and program host Dr. Jim Mathews.